For parents of little kids, sleep can often feel about as stable as a straw house. One mild breeze and the whole thing can come crashing down in the form of whines, tantrums, frequent night wakings and a bedtime routine that takes longer than running the Boston Marathon. What makes this all the more frustrating is that we’ve spent so much time and effort building a strong foundation for that delicate structure that any bobble or slight collapse makes us feel like we have to start building all over again. We become the highly underpaid and stressed out General Contractor of a feeble construction site in a bad part of town. In an effort to avoid total destruction, we sacrifice spending more time at that play date, or staying out late at a family’s party, in order to get our kids to sleep on time. However, a well-meaning friend, family member, or even a spouse who doesn’t realize how fragile this whole sleep operation is can blow an unintentional hurricane into your sleep routine, that will totally sabotage everything you’ve worked so hard to guard against. And there is not enough plywood and duct tape to protect against that kind of disaster. So what kinds of “hurricane-force” sleep interruptions should you be on the lookout for? We thought it would be fun to bring you some of the zanier sleep disruptions we’ve heard about over the years. 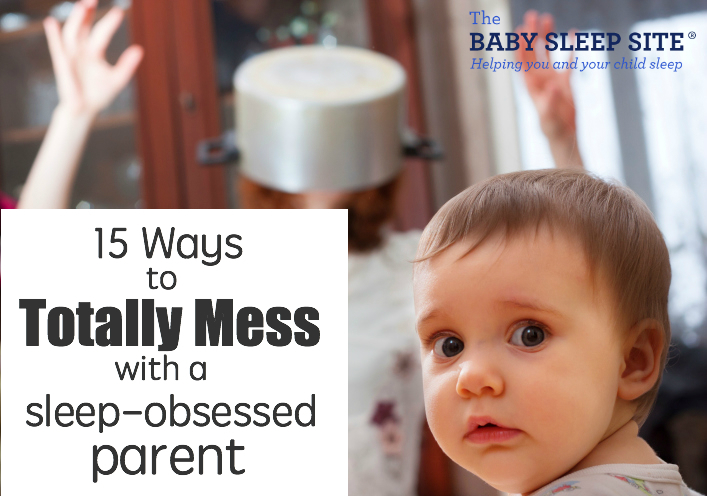 Keep reading for 15 truly crazy ways to mess with a sleep-obsessed parent! Choose nap time to start drilling that IKEA desk together. Start a favorite Disney movie 15 minutes before bedtime. Ignorantly ring the doorbell, even though there’s a post-it right on the door that politely reads “please knock”. Play hide and seek with the kid’s lovey before nap time, but then immediately forget the last place it was hidden. Shun a calming bedtime story, like Goodnight Moon, in lieu of something more “exciting”, like The Legend of Sleepy Hollow. Let the kids know that you’ll be catching up on all their favorite cartoons while they sleep. Decide that nap time would be the perfect time to test the smoke alarms. Announce before putting the kids down for nap that after they wake up, the whole family will be going to Chuck E. Cheese. Skip story time before bed, and opt for “trampoline time” on the mattress instead. Offer to put the kids to bed, and then dress them in pajamas with really scratchy tags on the collar. Ask the parents if the toddler can have a quick snack before nap time. When parents say yes, offer the toddler a few handfuls of Skittles. Figure that, since it’s a pretty day, it’s a great time to rev up that motorcycle…and then let it idle forever. Since the baby looked so tired, assume it’s okay to just let them sleep “for a couple of minutes to take the edge off”, RIGHT before nap time or bedtime. Be sure to hand the baby off to parents only after she’s woken up and is really starting to scream. Sneak in to give that adorable baby one last, big, noisy smooch before leaving to go home. Be sure to step directly on all the squeaky spots on the floor as you walk out of the room. Keep in mind that while the occasional “gale force wind” of a sleep interruption may happen, and temporarily destroy the quality sleep you’ve worked so hard to build, interruptions are to be expected every now and then. Such is life. We just hope that your interruptions are a little less “cruel and unusual” than the ones we just listed! Even the most sleep-obsessed parent needs a little sleep help now and then. (Okay, maybe LOT of sleep help right now!) That’s where we come in 🙂 If you need sleep help from an expert, that’s guaranteed to work, we can help! Our team of expert consultants is ready to offer you compassionate, caring support that is 100% personalized to your unique situation. We will craft a Personalized Sleep Plan™ specifically for your family, that walks you through every step of the sleep coaching process, in a way that matches your goal and parenting style. Okay, confession time – what’s the craziest sleep-sabotaging technique you’ve witnessed? Let’s get the conversation going! Have grandparents arrived, with presents, 5 minutes before bedtime. @ Suzanne – Yep, that one is a bedtime killer for sure!